Beware, email appearing to come from (UPS) or United Parcel Service may be a Trojan.Â The infected email states that it’s coming from “United Parcel Service” or “United Parcel Service of America” and usually starts out stating in the subject line “UPS Delivery Problem“. 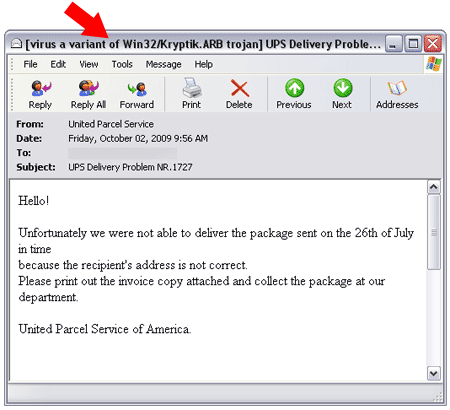 An attachment is shipped (pun intended) with the message and once the attachment is opened, your computer becomes infected with a virus variant of the Win32/Kryptik.ARB trojan. Note that this email was caught by my Antivirus software before it did damage. The best advice is to ensure that your Antivirus software is kept up to date (especially prior to performing any activity over the internet) and remember not to open any attachments unless you specifically know the sender is sending them. ESET Smart Security caught this Email Trojan before it could do damage. You can get a Free 30 day trial HERE: ESET Smart Security Trial.